I’ve posted before about how every inch of my garden has to work hard. I’ve installed shelving for pots of squashes, courgettes and peppers (and more!) along the only wall that had space. When you can’t grow out, you grow up! But the wall was just a bit wider than the shelving I put together. I was looking for something really narrow that I could use to squeeze a few extra plants into the space. Hanging baskets weren’t ideal (I’d rather not have a row of five as I wouldn’t be able to reach the top ones) and I couldn’t find any other shelving that was narrow enough. 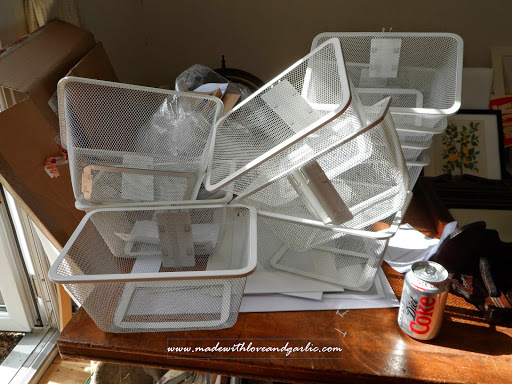 Until I found the (extremely ugly) Algot storage rack from IKEA. It’s certainly not an external system – there are small bits of rust already showing on the fixings which is why I didn’t want to drill it to our external wall and risk rust stains. However, by lining the baskets with hanging basket liner, I’ve managed to create ten new plant pots for four different types of peppers! I attached the Algot systems to the shelving using plastic ties and the peppers are thriving! 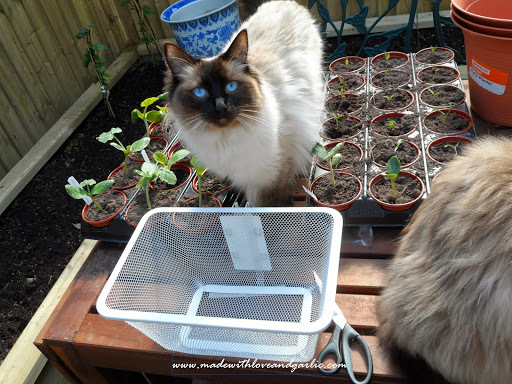 Have you ever hacked anything or used anything unusual in the garden to fit an awkward space?